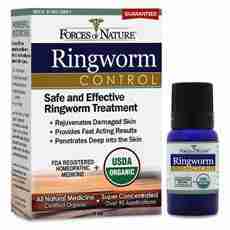 →What Is A Quick Cure For Ringworm? If you have a problem with a ringworm rash then follow our sixteen steps for a quick cure for Ringworm. Apply antifungal cream or lotion. If you have a mild case of ringworm, you can use an antifungal cream to fight the infection. Apply the cream or lotion as indicated in the dosage or by your doctor. As a rule, you should treat the area of infection for 2 or 3 weeks. You can buy antifungal creams at most pharmacies and in some supermarkets or speciality stores. Slice a clove of garlic and hold it on the ringworm. Garlic is a food known for its antifungal properties. Apply apple cider vinegar to the ringworm. Apple cider vinegar is another food known for its medicinal properties. Apply salt and vinegar to dry ringworm. Some people recommend preparing a paste with salt and vinegar and applying it on ringworm. Use lavender and tea tree oil. Tea tree oil and lavender oil have powerful antifungal properties. If pure lavender oil is too strong for your skin, you can try diluting it with a little-distilled water. Try a solution of aluminium salts. 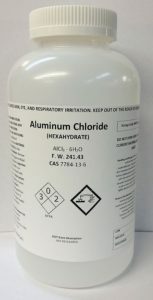 Aluminum salts, for example, aluminium chloride or aluminium acetate, are known for antiperspirant effects. Mix one measure of this solution with 20 parts water. You must apply the solution every 6 to 8 hours. It is advisable to apply the solution before going to bed because the production of sweat is lower during the night. You must rinse the solution before you start sweating too much. Repeat these steps until ringworm disappears. You can buy aluminium salts in pharmacy. Take care of your hygiene. Good hygiene is an essential part in the prevention and treatment of ringworm. Use antifungal shampoo for ringworm on the scalp. If you have caught ringworm on the scalp, use an antifungal shampoo that contains ketoconazole (eg Nizoral). Dry your skin well before wearing clothes. Be sure to let your skin dry completely after showering. You can dry your skin with a towel or let it air dry. Use talc or cornflour to keep the skin dry. These products help to absorb excess sweat. Reducing the amount of sweat will help prevent fungal infections. Avoid sharing personal items. Ringworm is highly contagious. Do not share your personal belongings and do not borrow those of others. Avoid getting too dressed to stay cool. Whatever the time of year, try not to wear too much clothing. Consult your doctor. If home remedies do not help you get better or cure ringworm or if ringworm is on your scalp, see a doctor. Take tests and get a diagnosis. Your doctor will probably diagnose ringworm simply by seeing it. Use antifungal creams prescribed by your doctor. Depending on the severity of your case, your doctor may prescribe an antifungal cream. Be sure to follow the dosage instructions for the best effects possible. Inform your doctor of these side effects if they become too much of a nuisance. Your doctor may give you blood tests before, during and after your treatment.